The Professional Regulation Commission announces the official results of the Guidance Counselors Licensure Examination this August 2015. The said exam was also known as Guidance Counselors board exam results (August 2015). Scroll down to see the exam results. The members of the Board of Guidance and Counseling are the following persons; Dr. Luzviminda S. Guzman, Chairman; Dr. Elena V. Morada and Dr. Carmelita P. Pabiton, Members. PRC usually released the exam results within three (3) working days from the last day of examination. PRC also advised those passers to wait for the announcement of the Registration for the issuance of Professional Identification Card (ID) and Certificate of Registration. Last year, PRC released the 288 out of 442 passed the Guidance Counselor Licensure Examination given in Manila City. Updated: PRC released the 252 out of 419 passed the Guidance Counselor Licensure Examination given by the Board of Guidance and Counseling in Manila this August 2015. 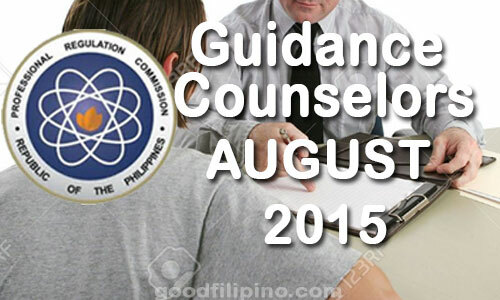 Comments or suggestions about "August 2015 Guidance Counselors Board Exam Results - PRC List of Passers (August 2015)" is important to us, you may share it by using the comment box below.